The Mimaki JV5 series large format inkjet printers offer a combination of high speed performance and excellent print quality. With a top speed of 58 sqm/h and quality prints at 40 sqm/h, it is made for both immediate delivery and high-volume production. The JV5 series include the grand format JV5-320S for large outdoor signs. The JV5 large format solvent inkjet printers feature 4 staggered print heads (per head 8 lines of 180 nozzles), enabling high speed printing. 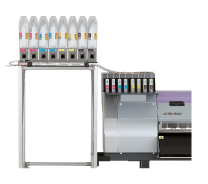 The Uninterrupted Ink Supply System allows for continuous printing in 4-colour mode. When one ink cartridge runs out, another cartridge of the same colour begins supplying ink. It is possible to print approximately 90 m without changing cartridges. Ink cartridges can be changed during printing. The bulk ink system is an eco-friendly ink system that produces less waste while achieving continuous printing. It uses 2-litre ink packs and achieves as stable and reliable ink ejection as printing solely with cartridges. It is possible to use both 2-litre ink packs in combination with regular 220/440cc cartridges. 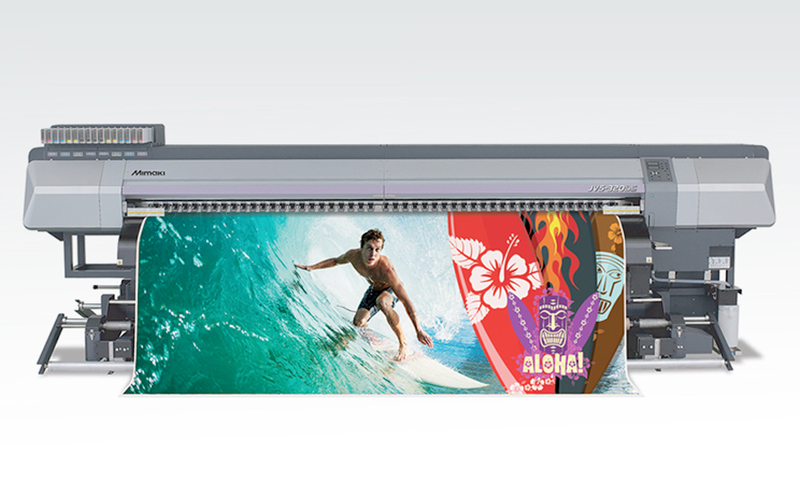 Mimaki’s HS ink offers high resistance and high speed high density printing for outdoor signage. 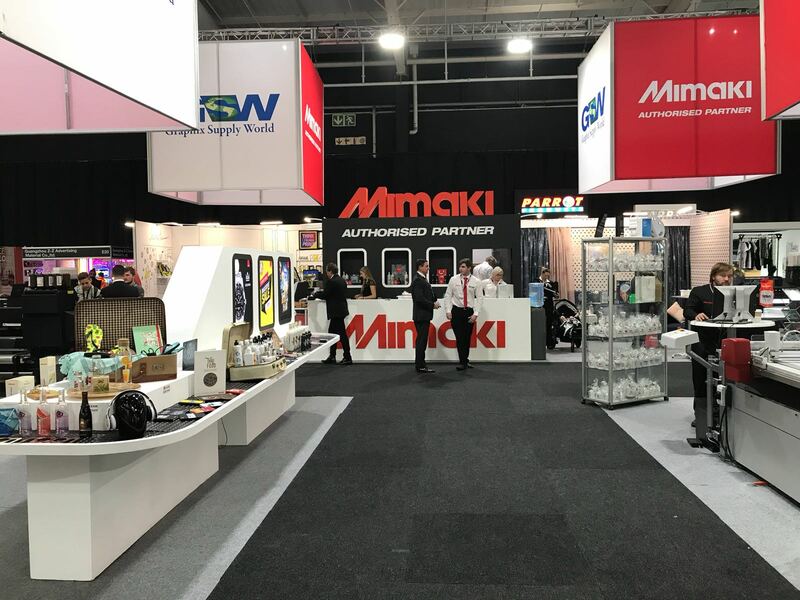 In addition, Mimaki offers the environmentally-friendly ES3 ink. For the aqueous model, dye sublimation inks are available. This feature monitors the ink discharged from the print head, resulting in quick detection and recovery of clogged nozzles. It lowers the chance of print failure caused by head clogging and reduces the waste of ink and media, thus saving time and money. With the automatic media feeder, JV5-130S and JV5-160S can handle rolls up to 130 kg (38 kg with standard model). For JV5-320S, there are two take-up devices available that enable the printer to handle rolls up to 130 kg. The thickness of the media is automatically detected and the height of the head is automatically adjusted to get the designated head gap. Even when the thickness of the media is changed, printing can be made with a constant head gap. This enables the user to always obtain the best printing results. Head gap can be set step-less in 4 positions between 1.5 mm to 7 mm. Intelligent heater to enhance color development and to fix the ink by automatically heating the media to its proper temperature. Equipped with a large-sized post-heater and drying fan, which promotes drying of the media printed at high speeds, thus enabling the winding. High performance RasterLink RIP software is included as standard to help youutilise the various functions of the JV5 series. An ink tray receives excess ink which passes through a mesh, avoiding the requirement for a liner. Ink in the tray is automatically raked out to enable longer printing without worrying about ink overflow. By printing on both sides of FF (flexible face), images for viewing both at night and in daylight can be enhanced to show the same greater brilliance. Especially suitable for eye catching backlit applications. When printing on the reverse side, a sensor detects marks printed on the front side and automatically compensates for shrinkage caused by solvent. In addition, the printing position in the head movement direction can be changed manually during printing so that the relative positions of double sided images can be adjusted.